In addition to his appointment in the Law School and as Vice President for Research, he is an Adjunct Professor of Informatics and Computing at Indiana University. 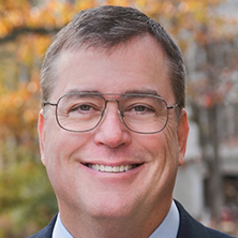 From 2003 to 2014, he served as the founding director of IU’s Center for Applied Cybersecurity Research, a National Center of Academic Excellence in Information Assurance Research and Information Assurance Education, where he is now a senior fellow. Professor Cate currently chairs the National Academies’ study on Law Enforcement and Intelligence Access to Encrypted Content, and he is a member of the National Academies’ Forum on Cyber Resilience as well as many other government, industry, and not-for-profit advisory panels. He serves as a senior policy advisor to the Centre for Information Policy Leadership at Hunton & Williams LLP. Previously, Professor Cate served as a member of the National Academies’ Committee on Technical and Privacy Dimensions of Information for Terrorism Prevention, counsel to the Department of Defense Technology and Privacy Advisory Committee, and a member of the National Security Agency’s Privacy and Civil Liberties Panel, the Federal Trade Commission's Advisory Committee on Online Access and Security, and Microsoft's Trustworthy Computing Academic Advisory Board, among many others. He chaired the International Telecommunication Union's High-Level Experts on Electronic Signatures and Certification Authorities. The author of more than 150 articles and books, he served as the privacy editor for the Institute of Electrical and Electronic Engineers' Security & Privacy and is one of the founding editors of the Oxford University Press journal, International Data Privacy Law. He is the co-author of a forthcoming book from Oxford University Press, Bulk Collection: Systematic Government Access to Private-Sector Data. Professor Cate attended Oxford University and received his J.D. and his A.B. with Honors and Distinction from Stanford University. A former Senator and President of the Phi Beta Kappa Society, he is a fellow of Phi Beta Kappa and the American Bar Foundation, and an elected member of the Council on Foreign Relations and the American Law Institute.